Astronomers using NASA's Hubble and Spitzer space telescopes have discovered the most distant galaxy seen in the universe. Called MACS0647-JD, the galaxy is 13.3 billion light years from Earth — which means it formed only 420 million years after the big bang. And just as remarkably, it's only 600 light-years wide, making it less than 1% the size of our Milky Way. To find such a tiny and distant object, astronomers had to use more than just a space-based telescope. By using an optical phenomenon known as gravitational lensing (where the light gets warped and distended by nearby galaxies), the scientists were able to magnify the region of space by a considerable margin — as much as eight times its normal size. Without this technique there would be absolutely no way for the NASA scientists to observe something so small and so far away. MACS0647-JD formed when the universe was only 3% of its current age, which means it was one of the first galaxies to ever emerge. The first galaxies started to form around 100 million and 500 million years after the big bang. It's very likely, therefore, that the galaxy was in the early stages of its development when this snapshot was taken. It's basically a baby galaxy. And it's quite possible that over the course of the last 13 billion years the galaxy has merged with dozens, hundreds, or even thousands of other galaxies and other galaxy fragments. But at the time, it was only 600 light-years across. For comparison, the Milky Way is 150,000 light-years in diameter, and our companion dwarf galaxy, the Large Magellanic Cloud, is 14,000 light-years across. The baby galaxy likely contained between 100 million to a billion suns — what represents about 0.1% to 1% the mass of our Milky Way's stars. 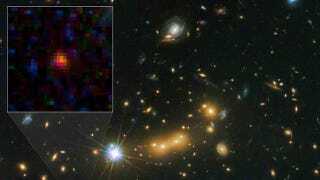 Going forward, the astronomers are hoping to find more of these embryonic galaxies — what likely provided the energy to burn off the fog of hydrogen that permeated the universe back then — a process, called reionization, that made the universe transparent to light. The paper is set to be published in the December 20 issue of The Astrophysical Journal. Images via NASA, ESA, and M. Postman and D. Coe (STScI) and CLASH Team & ScienceBlogs.